I made this cake for an afternoon tea team-building event at work, based on a Peggy Porschen recipe I found online. It also gave me the chance to try out some cake stencils I got for Christmas. Peggy Porschen has a cake shop and baking academy in Belgravia near where I used to work - I often used to walk past the shop, which is pink, though I never really found an excuse to go inside and have cake on my lunchbreak or the way to work! Peggy also featured in the finale of the last series of the Apprentice, giving advice to aspiring baking business owner Luisa Zissman. I thought it was quite funny that "Peggy Portion" was trending on Twitter; a lot of people seemed to think her name was spelled that way and that it was perfect for a cake maker! The recipe that I used is here, though my cake unfortunately turned out nothing like the picture! Preheat the oven to 175C and grease and line a cake tin. Cream the butter and sugar with the salt and vanilla. Then mix in the eggs. Bake in the oven for about 30 minutes until a skewer comes out clean. You're supposed to slice the cake into three - or make three separate cakes - but I made one and sliced it in half. Spread one layer of the cake with mixed berry jam. I got this pack of cake stencils for Christmas and hadn't used them yet. There are a selection of designs and you just sprinkle cocoa powder or icing sugar over the top. First spread the buttercream on top and around the sides of the cake, using a cake smoother or spatula to smooth the sides. Then place the stencil on top and sprinkle over the cocoa powder. Carefully lift the stencil off and you should be left with the pattern. I think I used too much cocoa powder here. Also, the instructions said to grease the underneath of the stencil so it would catch any excess rather than letting it fall onto the cake and I stupidly skipped this part - I was doing this at 7am before work, as I thought if I put the cocoa on the night before it might sink into the buttercream. I will follow the instructions properly next time - has anyone else tried to use a stencil on a cake before? I am sending this to the No Waste Food Challenge - I don't eat jam so whenever I buy a jar it's usually for a cake, and then I have to find something else to use it up in, so this cake saved me from having to throw the jar away! 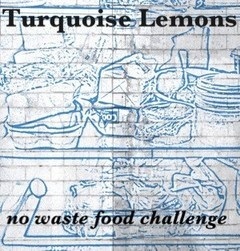 The challenge is hosted this month by Elizabeth's Kitchen Diary on behalf of Turquoise Lemons. Well I think that looks pretty spectacular. The stencils are really affective.